Denmark has the greatest percentage of mothers in work of any developed nation, according to figures from the OECD. More than 80% of Danish mothers work, according to the report, which looked at women aged 15-64 with at least one child. While Denmark comes top with 82%, Sweden, Slovenia, the Netherlands and Austria aren’t far behind in terms of maternal employment. Greece comes bottom of the OECD countries with just over half of mothers employed. Additional OECD studies on the quality of life in Denmark show that a much higher percentage of Danish mothers (78%) than the OECD average (66%) are employed after their children begin school. This suggests there are better opportunities for women in Denmark to balance their careers and family lives. As University of Leeds fellow Jana Javornik points out, in social-democratic countries like Denmark, Norway and Sweden, there are more public policies that support ideals of gender equity and working families. Paid parental and sick leave, for example, are offered to all parents and there are higher levels of investment in public childcare. Compare this with Mediterranean countries, where many parents rely on family members to take care of children and women are often unable to return to work because of their role in childcare. The OECD data on working mothers was compiled as part of a report looking at equal partnerships in families in Germany and uses data from 2012-13. It suggests higher levels of part-time work for mothers in Germany than the OECD average – 39% of working mothers in the country hold part-time positions. 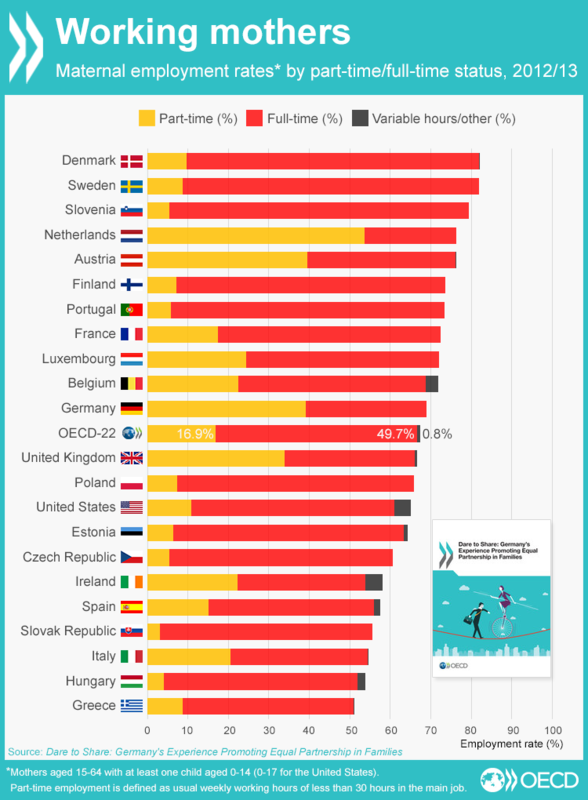 Only in the Netherlands and Austria does part-time work for mothers constitute a bigger percentage of employment. Why do so few German mothers go back to work? Is it becoming easier to be a working mother? Germany’s population continues to face challenges in achieving a work-life balance with high levels of part-time work among employed mothers suggesting a large amount of unpaid work carried out at home. "This not only weakens the economic position of women, but also negatively affects economic potential in the face of demographic change," says Monika Queisser, Head of Social Policy Division at the OECD.